Funerals are bittersweet—a time of mourning after the death of a loved one and a celebration of a life that was once lived. Different types of ceremonies are held as a way of paying tribute to a deceased friend, spouse, sibling, parent, or relative. During these events, various reading materials are distributed among visitors to communicate a message pertinent to the occasion. One of which includes the roll-up banner. These banners play an important part in sending an announcement to a specific audience in the most eye-catching way possible. One way to honor someone in the most gracious way you can think of is to use a roll-up banner during their funeral. Funeral programs and funeral flyers can be a bit costly to produce due to the number of copies that need to be printed to accommodate each guest. So to help cut down on your funeral expenses, consider using a roll-up banner instead. 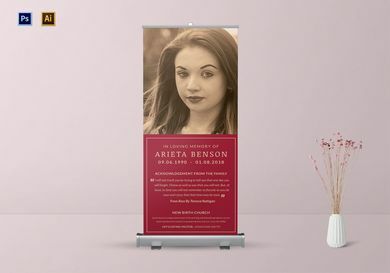 An elegant banner enables you to portray an individual in a positive light, while also giving you the opportunity to make important reminders for everyone to see. This is great for funeral and memorial services that are held at sophisticated venues with a large number of guests. Truth is, we’re all living on borrowed time. We never know when our last day would be, nor can we predict what the future holds for those around us. Sudden deaths are a clear manifestation of the saying, “Expect the unexpected.” This is what makes funeral announcements difficult for most people to do. Although newspaper obituaries are a common choice, you do have the option to use a roll-up banner instead. 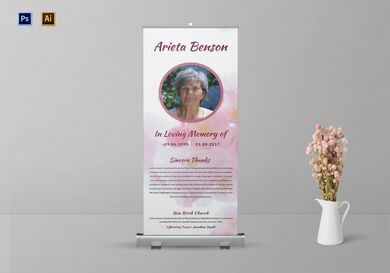 Funeral announcement roll-up banners are great for tight-knit communities where everyone knows everyone because of how quickly a message is delivered to those around your neighborhood. You can put the roll-up banner on display in the funeral home or your front yard to capture the attention of bystanders and passersby. Unlike weddings and birthday parties, inviting family and friends to one’s funeral can be a struggle due to several factors that make it difficult to reach every single person within a given time frame. Even with technology and social media widening our communication reach, you can’t expect every single person to get your message. However, it won’t hurt to use several different channels to make sure you inform as many people as possible. 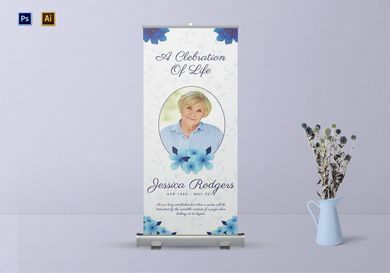 In addition to your invitation cards and bulletin announcements, consider using a funeral invitation roll-up banner as well. 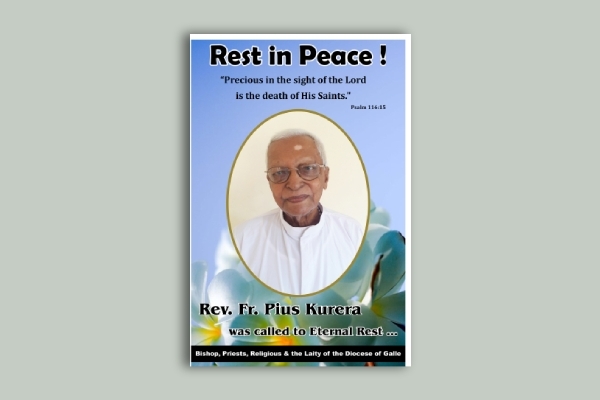 Funeral services that are held for prominent individuals in the community are generally open for public viewing. To inform the public about this matter, you can use a roll-up banner to make your announcement. Losing someone forever, regardless of the circumstance they were in, is never easy. Words aren’t enough to express how thankful you are for what they have done to make your own life worth living. 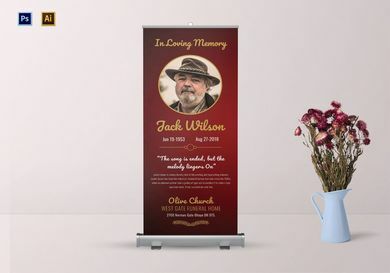 To commemorate someone, you can use a funeral roll-up banner as a way of showing your love and respect for the individual creatively. You can even include a tribute to the deceased by having friends and family write down their personal message in a piece of paper before transferring it to the banner. All you need to do is gather inputs from loved ones, download the template above, and customize its content to meet the requirements. Not only will the banner be used to honor an individual but it can also help you announce significant details of the funeral for visitors to be aware. With the long list of tasks and materials that need to be settled as part of the funeral arrangements you have planned, looking for a more efficient approach to cross out items on your to-do list is bound to make everything much easier. 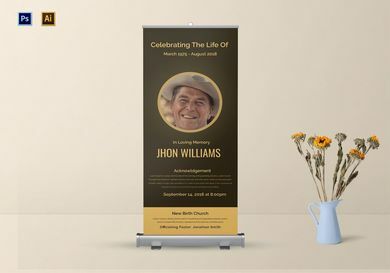 Rather than spending your resources on individual funeral invitations and brochures, you might as well put everything together through a simple roll-up banner. This allows you to carry out details of the funeral for guests to be informed about the what, where, and when of the upcoming service. In most cases, banners are used in place of ushers and usherettes so that visitors at the funeral are guided at all times. Given the size of the roll-up banner, you’re sure to catch the eyes of anyone who encounters it as it lies by the entrance or hallway of the venue. Shown above is an example of a funeral banner dedicated to someone who was a part of the congregation. While most roll-up banners are designed for the convenience and information of close friends and family members of the deceased, people who might have played a significant part in the welfare of the community also deserve some type of recognition. Fortunately, the size of a roll-up banner is big enough to grab the attention of anyone in the room. The content of the banner doesn’t need to be wordy, just as long as it conveys the message you had in mind without much effort. One of the things to remember when designing a banner is to always keep it readable for easy comprehension. The death of a loved doesn’t always have to be a time of grief and remorse. At some point, the time will come for us to be one again with our Creator. But until then, all we can do is pay tribute to the deceased and the memories that were shared during their time on Earth. With that said, feel free to browse through the templates that were provided in this article to download the one that best suits the occasion. Such templates may even be customized to effectively serve your purpose.